Enter for a chance to win a TRIP of a LIFETIME! Drawing at 2019 State Convention; need not be present to win. 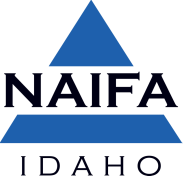 NAIFA Boise monthly meetings take place on the 3rd Thursday of the month at Louie's in Meridian, ID at 11:30am. If you have questions or would like more detailed information, click here to contact local leadership. Stay tuned for updated information regarding location, dates, and times. If you have questions or would like more detailed information, contact David Hruza at hia@pmt.org. Stay tuned for updated information regarding location, dates, and times. If you have questions or would like more detailed information, contact Jeneane Sorensen at jeneanesorensen@yahoo.com. NAIFA Eastern Idaho monthly meetings are held at College of Eastern Idaho. Lunch is at 11:30am and C.E. begins at 12:00 noon. If you have questions or would like more detailed information, click here to contact affiliate leadership.